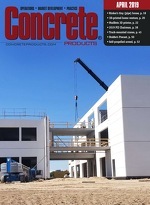 Demand for precast concrete in infrastructure products is projected to increase 4.4 percent annually, to $2.4 billion by 2022, with growth fueled by the need to repair the nation’s aging network of bridges, highways, roads and railroad tracks; increased adoption of the method over traditional cast-in-place alternatives; and, efforts by the federal government to increase surface transportation investment. The five-year market outlook is presented in “Precast Concrete Products In the US, 4th Edition” from Cleveland market researcher Freedonia Group. Through 2022, authors note, demand for precast concrete bridge components is expected to increase 5.8 percent annually, to $1.1 billion, the fastest pace of any infrastructure component. Demand growth will be driven by a) the high number of bridges currently rated as structurally deficient that will require significant maintenance and repairs; and, b) increased usage of precast concrete bridge components as the absence of curing requirements and other site factors typical of cast-in-place methods allows bridge repair and replacement jobs to be completed more quickly—minimizing disruptions for motorists and waterway traffic. The National Commission for the Certification of Crane Operators has launched the Telescopic Boom-Swing Cab Restricted (TLL-R) certification program for operators of boom trucks with short booms, no attachments/extensions, and a basic load chart. A restricted version of the Telescopic Boom Swing Cab (TLL), it covers equipment classes commonly used in precast concrete delivery. Crane operators achieving the TLL-R certification are restricted to operating telescopic cranes with a maximum 37-ft. boom length. Certification candidates must pass the Mobile Crane Operator Core written exam as well as a modified version of the Telescopic Boom written exam that features a QMC boom truck load chart. The type of crane used on the TLL-R practical exam must match the type an operator wishes to be certified for, such as swing or fixed cabs, with rotating and fixed operator’s stations. All NCCCO certification eligibility and medical policies common to other CCO operator certifications apply. More program information is available in the Mobile Crane Operator candidate handbook, posted along with new exam, test option and fee details at www.nccco.org/tbr.